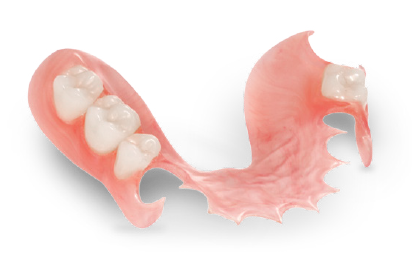 Smile Rite™ Clear is the ideal partial for the partially edentulous patient. For patients seeking an esthetic alternative to the traditional cast partial, look no further than Dental Masters’ Smile Rite™ Clear. Smile Rite™ Tissue is composed of an advanced thermoplastic and provides patients with excellent color stability. Its esthetic translucency makes Smile Rite™ Tissue virtually invisible in the patient’s mouth. Fabricated to seamlessly blend with patients’ surrounding dentition, Smile Rite™ Enamel is formulated from acetal resin to match the classic VITA shade guide, and provides the most natural esthetics available.